A certain pressure comes with being a top draft pick. There's even more when you're taken first overall. 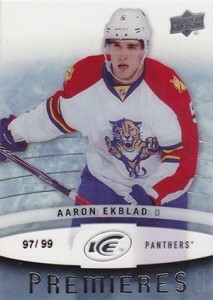 Such is the case with Aaron Ekblad who kicked off the 2014 NHL Draft when he was selected by the Florida Panthers. The hobby spotlight might not be very bright in the Sunshine State but the defenceman is draw considerable attention among the 2014-15 rookie crop. 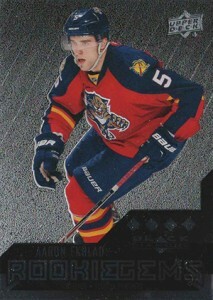 Shop for Aaron Ekblad cards on eBay. 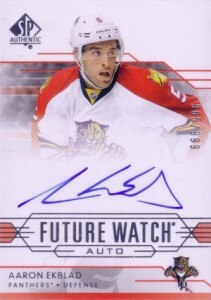 Cracking Florida's lineup on opening night, Ekblad became eligible for rookie cards in 2014-15 products. He rewarded collectors with a stellar first season and won the Calder Memorial Trophy as the 2014-15 NHL Rookie of the Year. Because Upper Deck released a couple of products before the season kicked off, he was not in the main releases for MVP, Ultra or O-Pee-Chee. Since then, he has been a focal point of every release. 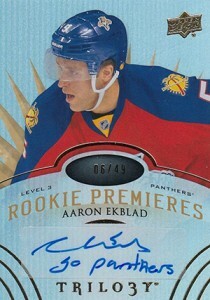 Besides base set rookie cards, Ekblad has been featured heavily on autographs, memorabilia cards and other inserts. 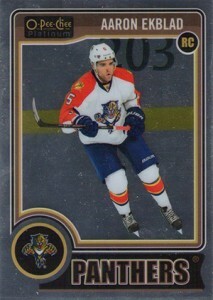 Ekblad also has minor league hockey cards dating back to 2011-12 In the Game Heroes and Prospects. He has both a base card and an autograph in the set. Click on the images or listings to shop for cards on eBay. The guide does not include inserts or set updates. The combination of an autograph and photo shoot patch puts this on the high-end scale. However, the price should be kept relatively in check compared to other autographed patch rookies as the autograph comes on a sticker and the Fleer Showcase brand doesn't have the same pedigree (or price tag) as The Cup. 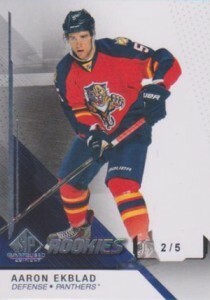 One of the most affordable Aaron Ekblad rookie cards, 2014-15 O-Pee-Chee Platinum fills the chromium void left when Upper Deck regained its hockey exclusive and Panini Prizm disappeared. Besides the basic version of the card, there are lots of colorful patterns. There's also an autographed insert, which is a decent deal for those who insist on on-card signatures. SP Authentic rookie autographs have a lot of history. While the numbering is on the high side, it still carries solid values compared to other basic autographs. Without Panini around this year, it gains more of an identity as well as most Upper Deck sets carry with it their own angle. 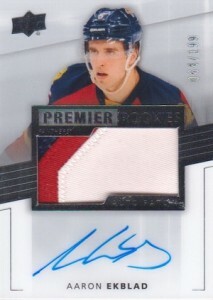 Base cards in 2014-15 SP Game Used Hockey are numbered to the player's jersey number. 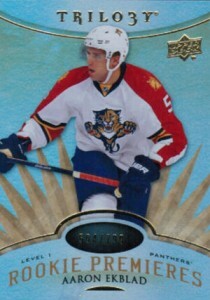 Aaron Ekblad wears a 5 on the back of his jersey. Needless to say, this is a rare rookie that most are just going to have to live without. Even if price isn't an object, there's such a limited supply that they're simply not going to surface often. 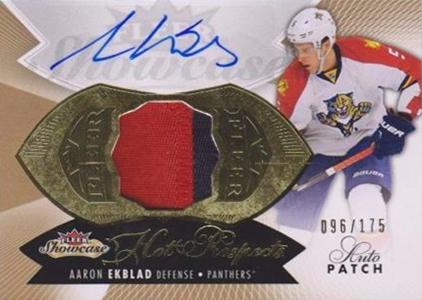 For those who want something from every product, Ekblad does have autographs and memorabilia parallels in the product that are much more plentiful. Upper Deck brought a Precious Metal Gems sort of feel to their 2014-15 SPx rookie cards. Autographs and large swatches of player-worn jerseys are still part of the mix, but different colored backgrounds have been added to add some pop to parallels. Numbered to 249, it's rare but not to the point where it's tough to find or incredibly expensive. 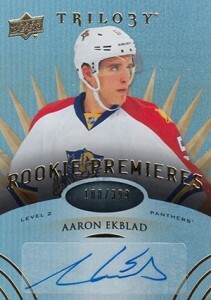 Both high-end and limited, the 2014-15 Ultimate Collection rookie card for Aaron Ekblad is one of his most valuable. The on-card autograph and print run of just 99 copies puts it in a special class for collectors. The Upper Deck base set is a favorite with hockey card collectors. Since the introduction of Young Guns as moderate short prints, the cards have taken on a life of their own both in popularity and values given their somewhat widespread availability. This is a safe choice for those without a huge budget or interest in autographs. The card is inserted in 2014-15 Upper Deck Series 1 packs. 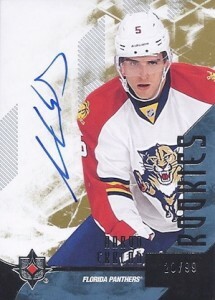 Like Ekblad's Young Guns rookie, he's also a short print in 2014-15 Upper Deck Black Diamond. Part of the Rookie Gems subset, he has a Quad Diamond designation. This is the toughest of the set's rookies. Even still, the card isn't terribly expensive. The bright parallels add some color for those looking for a chase. This card has a couple of things going for it. It's expensive because of the low print run of just 99 serial-numbered copies. Aesthetically, it's different from his other rookies due to the fact that it's printed on acetate. Artistic and ornate, the Aaron Ekblad rookie in 2014-15 Upper Deck Masterpieces offers a high-end feel with a budget price point. Signed versions are also available. 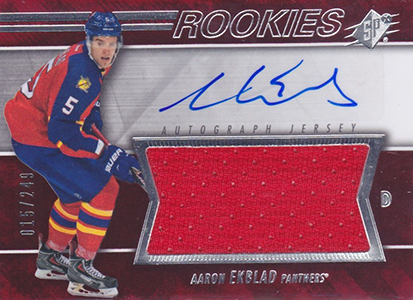 Aaron Ekblad has three cards in the 2014-15 Upper Deck Trilogy base set. 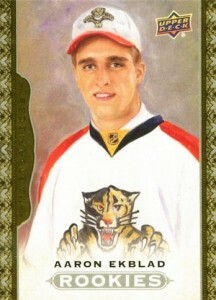 The most common is numbered to 799 and is considered a traditional rookie card. That said, few will deny that either of his two autographs are desirable as well. The Level 3 Rookie Premieres card, numbered to just 49, also includes a short inscription. 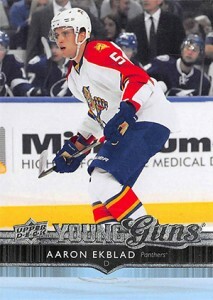 2014-15 Upper Deck Series 1 Young Gun #225 Aaron Ekblad Florida Panthers RC! Do one for Sam Reinhart please!